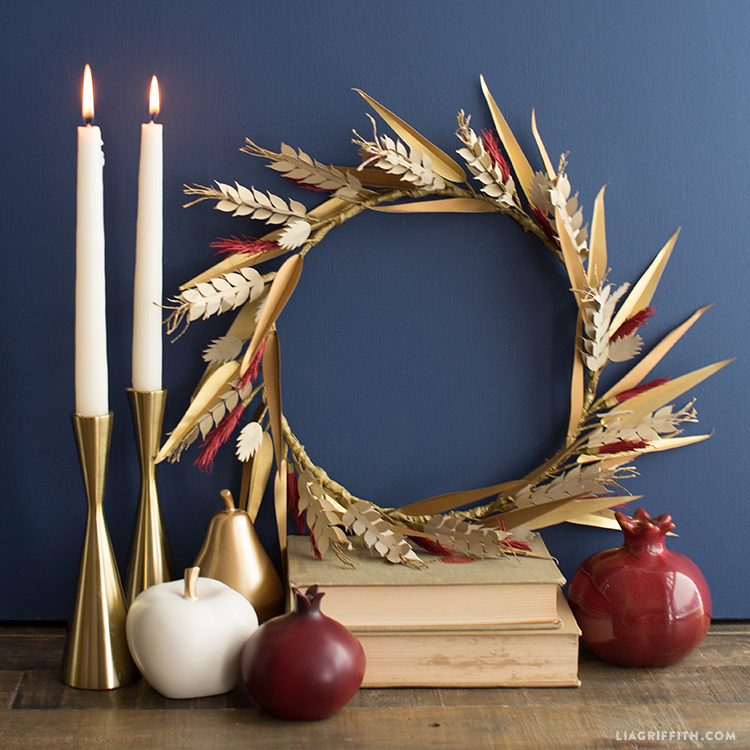 Tis the season for wreaths galore! 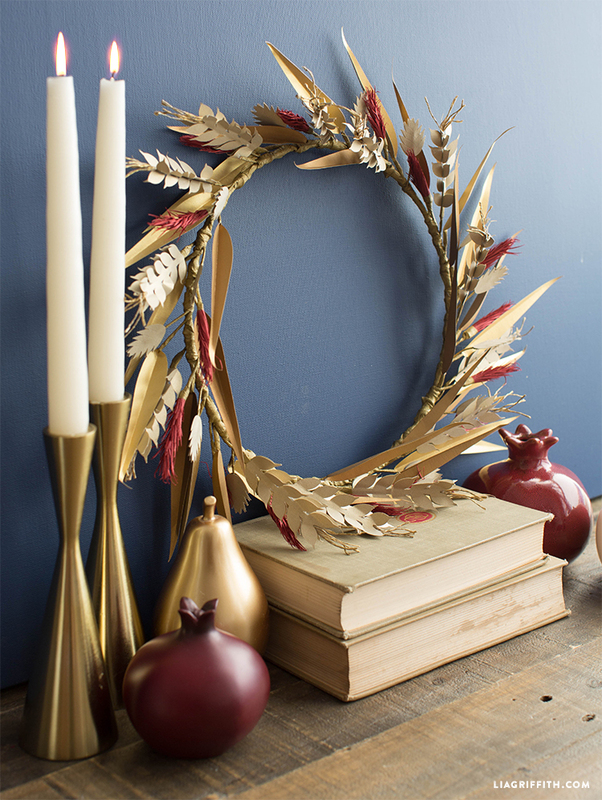 We have so many fantastic DIY wreath options for you to browse on our site. 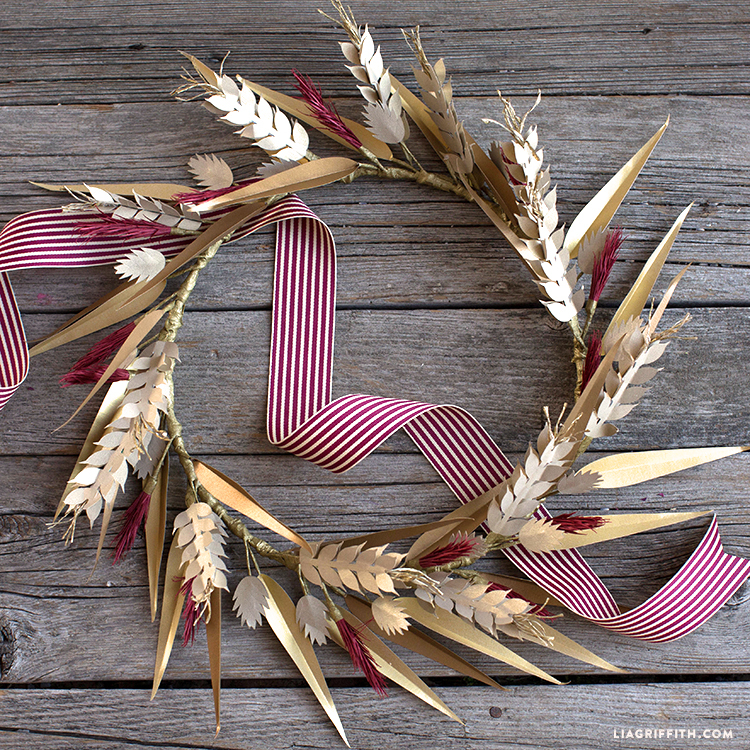 This gorgeous paper wheat fall wreath is our latest and an absolute must-craft! For this project, we used Paper Papers text weight metallic paper. 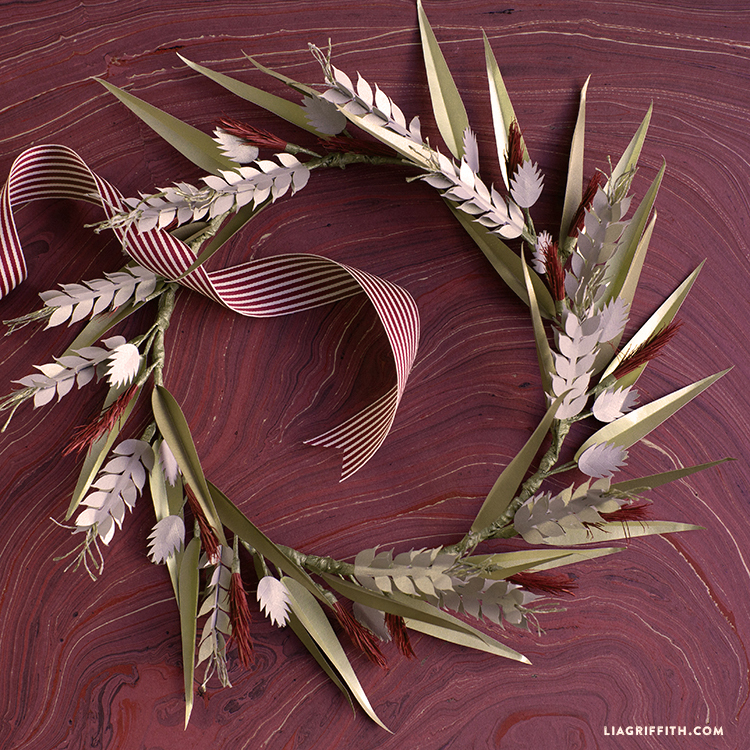 Unique in its thinner composition and subtle shimmering quality, it is the perfect material for DIY wreaths, flowers and other projects of the like. 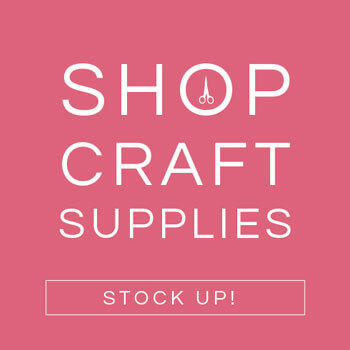 Simply gather the supplies listed below and then pop over to PaperPapers.com to access our step-by-step photo tutorial. Happy autumn and happy crafting! Next, cut about seventy 4” lengths of wire. 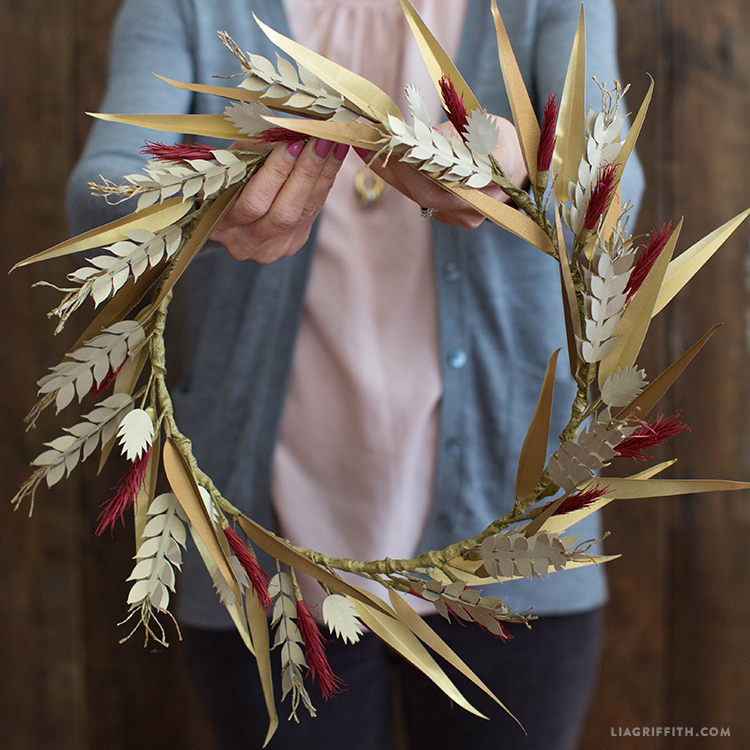 Fold along the score lines of the leaves and glue a wire onto the bottom of the leaf, then wrap it with floral tape. Make about thirty five — half in Antique Gold and half in Pure Gold. Glue one end of the red fringed paper to the tip of a piece of wire. Wrap the paper around and down the wire and glue into place, then wrap the rest of the wire with gold floral tape. Make about seventeen. Next, wrap the remaining wires in gold floral tape. Adhere a wheat shape onto the tip of the gold wrapped wire, them glue another one onto the backside to sandwich the wire between the paper. Make about seventeen. Twist each finger of the fringed crepe and then wrap it around the tip of a wire and glue it into place. Take two pieces of wheat and glue onto either side of the wire, then fold the wheat up away from the wire. Then wrap the base of the wheat and the wire with the gold floral tape. Make seventeen large wheat stalks. 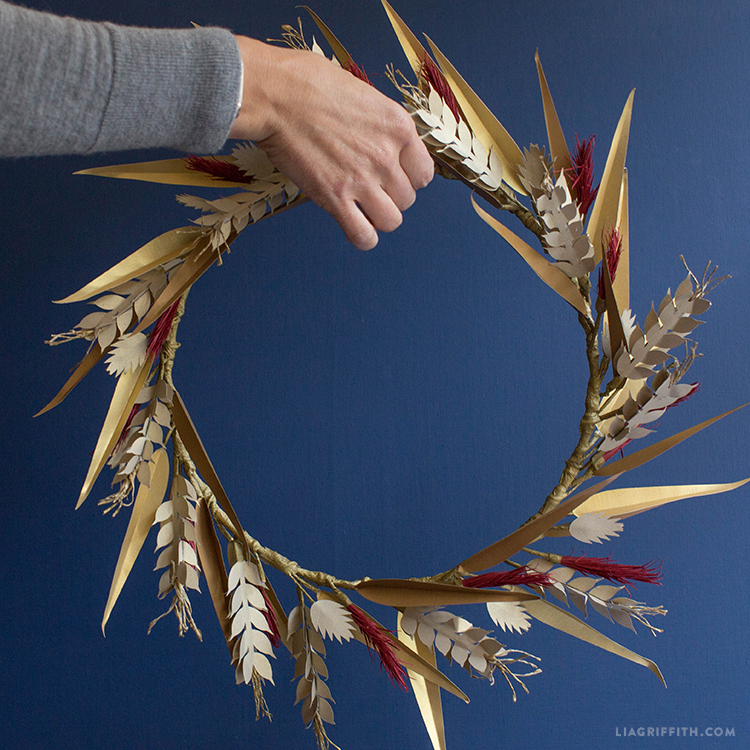 Start with the leaves and attach them to the gold hoop by wrapping the wire around it, then securing with floral tape. Attach all of the leaves so they are all slanting in the same direction with half of them pointing out and the other half pointing in. Repeat steps 10 and 11 with the red grass, evenly distributing about seventeen pieces around the wreath. Again, repeat steps 10 and 11 again with the smaller wheat pieces. Finally, repeat steps 10 and 11 again with the large wheat pieces, then arrange the wreath as desired. 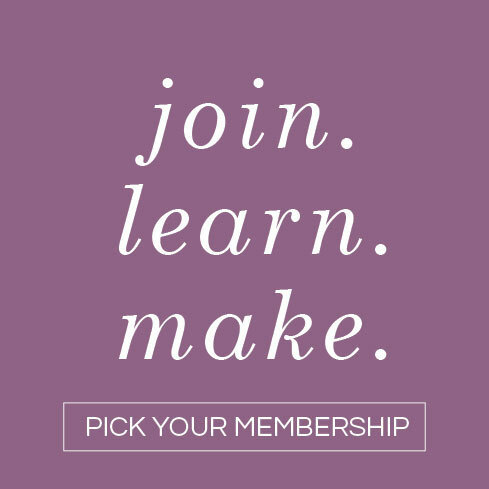 To access all of our downloadable templates and tutorials, become a Lia Griffith member today! For more DIY inspiration, join us on Instagram, Facebook and Twitter. And don’t forget to use #MadeWithLia when sharing photos of your latest projects — we love seeing your creativity in action. 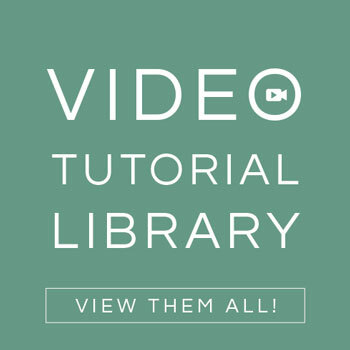 I do not see the large wheat shape on the svg file. I do see it on the template, but I’d like to cut on the Cricut. Can you please advise? Thanks, in advance! Thanks for catching that! It’s in the SVG file now. Thank you Lia. I appreciate the free templates.